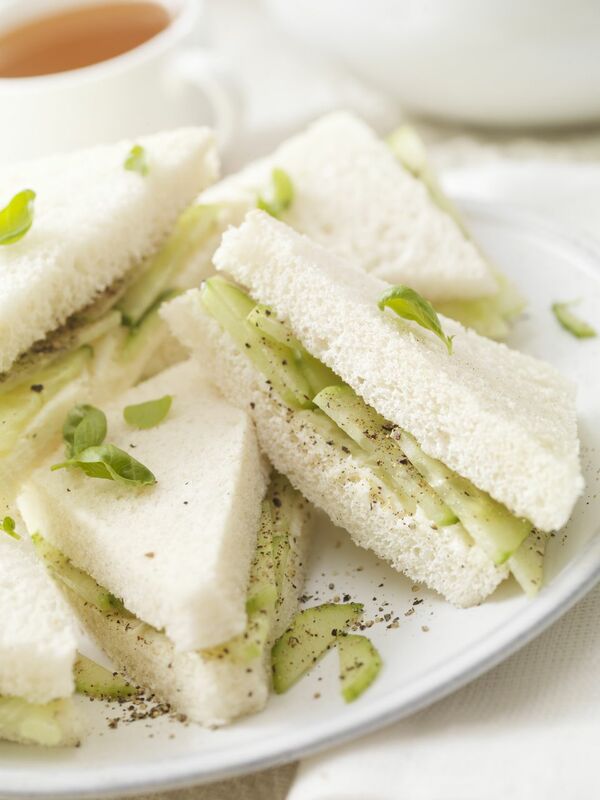 This easy cucumber and cream cheese finger sandwich recipe is ideal for kids' tea parties, but it can also be prepared with spices for a more "adult" flavor. You can enlist your children to help in assembling the sandwiches for a kids' party. Kids can help in cutting off the bread crusts, spreading the cream cheese, and placing the cucumber slices. If your child is just learning about triangles, or even an older child digging into geometry, you can discuss the best ways to display these fun triangular sandwiches. For adults, cucumber tea sandwiches are a very traditional choice for an afternoon tea party. You might also serve egg salad tea sandwiches or salmon and cream cheese tea sandwiches. Be sure to include scones with lemon curd, marmalade, and butter. For every two slices of bread, spread both slices evenly with cream cheese. Cover one side of the sandwich with sliced cucumber. Season with lemon juice and spices/herbs. Put the slices together, cut off the crusts, and slice the sandwich diagonally two times to create four triangle finger sandwiches. It's best to serve these sandwiches soon after you prepare them, so the bread doesn't dry out or become soggy from the cucumbers. If you want to refrigerate them to serve later, it is better to drain the cucumber slices for 15 minutes in a colander, and pat them dry before you use them. This will remove the excess juice. Cover them with plastic wrap to keep the bread soft while refrigerated. To peel or not to peel? If you bought waxed cucumbers, it is best to peel them before using. But if they are unwaxed, you won't need to peel them. Another variation is to only partially peel them, with vertical stripes. This makes them a little more attractive. The peels add fiber, so it is good to leave them intact. It is preferable to use organic cucumbers if you are not peeling them, as there can be pesticide residues in the peels. Don't toss the trimmed bread crusts. You can use them to make croutons or breadcrumbs. Or, put them in a bag to take to the park to feed the birds. Geese and ducks will appreciate what would have gone into the trash or compost bin. While this recipe uses white bread, you can consider using wheat bread or gluten-free bread. Try making half of the sandwiches with white bread and half with wheat bread then alternate them on the serving tray.